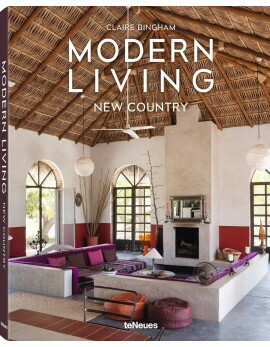 Modern Living New Country, ISBN: 9783832734961 - available from Nationwide Book Distributors Ltd NZ. Everything you need to know about the modern rustic look From cottages to chateaus, inside the world’s most inspiring rural homes Step-by-step guides to create your dream interior Considered, calm, and irresistible—modern rustic style is all about simple, casual living. Be it a log cabin, a Moroccan villa, or a chalet perched on a mountainside, the element that unites these rural escapes is a passion for craftsmanship and a pared-down quality that allows the beauty of natural materials to shine through. The interiors are stripped-back and the objects within it are useful and timeless—each with a story to tell. The latest addition to the new Modern Living series, New Country, penned by design writer Claire Bingham, explores some of the most beautiful homes in the countryside and shows how to get the look yourself. It’s also a book full of practical tips—from how to mix heirloom and contemporary pieces with confidence, to putting together a relaxed scheme where the driving force is comfort.